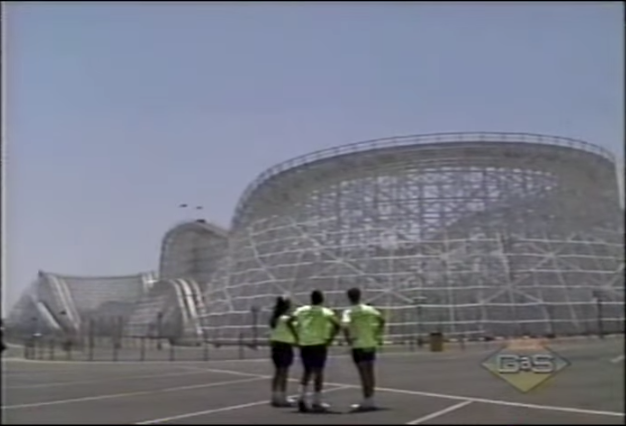 With Colossus’ days numbered at Six Flags Magic Mountain, I thought it be appropriate on this Throwback Thursday to share a bit of my childhood relating to the “King of Wooden Coasters” before it’s too late. Like many other early Millennials, I grew up with Nickelodeon. And not the crap Nickelodeon they’re passing off today. I’m talking Salute Your Shorts, Rocko’s Modern Life and Double Dare holy crap this is amazing Nickelodeon. Colossus, gleaming under the spotlight of basic cable television! Now, the editing isn’t very good in terms of continuity (I think they show the first drop three times and the double up twice). But it still shows a beautiful and thrilling Colossus – and an interesting game to boot. Enjoy this bit of 80’s / 90’s kid nostalgia – and #FarewellColossus! If you’re looking for the latest on what comes after Colossus, be sure to check out our friends in Southern California, The Coaster Guy and Park Journey. Video is used only for educational or informational purposes. No claim of copyright intended.